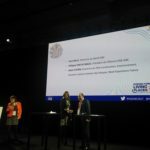 Alliance HQE-GBC and Smart Building Alliance published the definition framework “smart building, fair building” presented by the Secretary of State for the Cohesion of Territories: a common language to accelerate the digital transition for all buildings. Buildings will become platforms for digital services to meet the expectations of their users. They will need to be connected and smart, focused on the users’ needs, for new buildings or existing buildings. • Reducing the risk of obsolescence of digital infrastructure with very high upgrade cost. 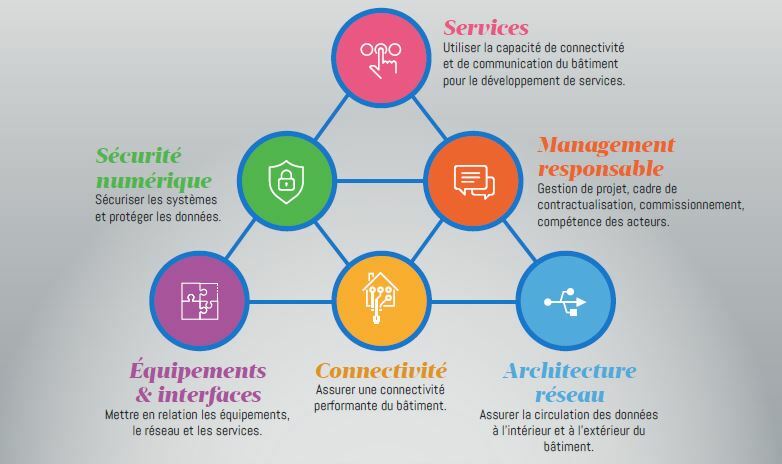 Facing the evolution of uses, the massive dissemination of digital technologies and the need to transform the building into a platform for digital services, the building professionals require a framework with key principles. This is the aim of the definition framework “smart building, fair building”. 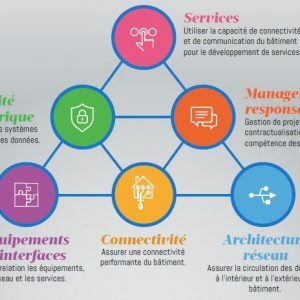 The definition framework describes the main technical and organizational principles to take into account in order to provide better connectivity, better networks, interoperable equipement and interfaces, a correct level of system safety and data protection in order to host the digital services in the best conditions.